Every night, all night, as I pin away working on the design of the new house I keep coming back to some of the same furniture makers/designers, desperate for their (master)pieces in our home. These are people/pieces that are super high quality, made locally, refined obsessively and because of that, they ain’t cheap, but they are so incredibly beautiful. I may never buy these pieces, but you don’t have to be able to afford them to glean inspiration from them. They remind me that the finish is essential, that simple details go a long way and that craftsmanship is worth the dough. My goal with this post is to applaud those that make the furniture, congratulate those who can afford it, and inspire those of us who love to look at beautiful things. Because, man, even though they are simple they can surely make a room. 1. BDDW (above and below) I’ve been a massive fan of their work for a decade. They have been ripped off (especially that table) but they continue to innovate in a completely classic, shaker inspired way. To be innovative, while being still ‘shaker inspired’ is truly a feat. Here are some of their pieces that I want very badly. The Deck Chair: A true piece of art and wonder. I don’t now where you are supposed to use it or if you are allowed to put anything except the most artisanal of frothy beers on that side table. If only our courtyard (and toddlers) could handle such beauty. The Abel Club Chair: Everything about the Abel is great and beautiful until you notice the arms and feet. You have to catch your breath because that shape in that wood is just so refined and yet has a bit of whimsy in it. I have no idea how much this chair is but I would assume at least $3k and it may be something I save for. I LOVE it. The Ladder Chair: Don’t get me started on this ladder back chair. It may look boring, but it’s high quality and tiny proportions are what makes it so beautiful and interesting. I keep thinking that we should get them for our new dining room but we don’t have the right table yet, so we are waiting. But man, I love these simple chairs (although I wish they came in a maple or some lighter finish options). The Grane Sofa: If you wanted a sofa version of the able chair, here you go. It’s absolute perfection. For our new sofa I wanted extreme comfort and I wasn’t able to sit on this beforehand (they only have a showroom in New York) so I couldn’t take the risk, but man, that is my spirit sofa. The Square Guest Chair: Leather, wood, and a tiny bit of brass make this chair a combination of my dream materials. We want more comfort in our dining chairs otherwise we would have pulled the trigger on this guy. Chall Side Table: A modern take on the classic iron bistro table. I think this is the piece i’m going to splurge on. I’ve loved it forever and it’s kid friendly (heavy on the bottom, round on the top). Hopefully its not $5k. (We emailed for pricing on all of their items but haven’t heard back yet). Next up is my friend Amber (interiors), who you all probably have heard of. She is a designer in LA that has absolutely mastered/coined the “California Modern” look. I look to her for inspiration all the time (and so do our clients). But maybe you guys don’t know that she has a line of furniture. Please note these totally perfect nightstands. The Anderson Side Table: They are handmade in LA by an amazing furniture maker and because of that, they are $3800 each. It’s the opposite of fast fashion and while it’s absolutely inaccessible for everyone, I love seeing these more aspirational pieces hit the market, sell and inspire the rest of us. The Topanga Ottoman ($995): I myself will be making a version of this – and crediting Amber, don’t worry. It’s a simple ottoman but with such detail and interest. Ozzie Dining Table ($7,950): So beautiful. So, so, so beautiful. I know that when we’ve had custom pieces made we often make a mistake the first or second time and I know that it’s true for most prototypes. So while it may seem like these are absolutely overpriced, I’d say that they aren’t. They are expensive, but buying the best always is. Penny Bed ($4,950): This bed has inspired me to put a cushion on every hard headboard I ever buy. Thanks for the inspiration, Amber. Next up is my favorite store in LA – Nickey Kehoe. I posted a store tour here along with a video a couple years ago, and their design work stands out, too. Coffee Table (3,950): Everyone at my studio wants this coffee table. In case you are bored by it and think it’s Ikea, I assure you that the quality of the wood, the grain, the tone, the finish, and the scale is so perfect that you are stunned in person. They have a dining size, too. So good. Classic Tufted Sofa ($7,150): It’s the Michelle Obama of sofas – so beautiful, comfortable, strong, feminine, inviting and conversation making. I love this lady. Farm Table ($6,950): After shopping for months for a farmhouse style dining table, I’m always excited to see one that is being made now that is so beautiful and authentic. I went to the store over the weekend and man is this table beautiful in person – it is so simple, refined, and classic. So those are my fantasy brands with my fantasy pieces. I consider them works of art. They are the Milo Baughman and Paul McCobb’s of our time. We’ve designed a decent amount of custom pieces for our clients and so much goes into it. First off the YEARS of training, experience building, getting paid for nothing, losing money and sleep while you practice/hone your craft. People seem to forget about that. Then each piece has hours and hours of drawing and rendering, sourcing of the perfect craftsperson, sometimes three different craftspeople per piece (wood worker, upholsterer, welder). Then sourcing of the perfect materials – especially with pieces that are simple you have to make sure that the material is stunning. Then the prototype making (where you lose money) and another round of tweaking and rendering. Plus the time obsessing over it. I know that I promote super budget-y, extremely accessible pieces from larger retailers as well and I truly believe that both those and these high end artists have a place in the world, my blog and my home. So who else am I missing? I know there are a TON of talented, innovative makers out there. I stuck to these three because of the classic/traditional yet modern style of our new house, but if you know of any others that I’m missing, please leave in the comments. I always meant to create a column on our resource guide (do you guys even use the resource page?) of makers that I love, so maybe your comments will inspire this list. P.S. I’m also shopping a lot at Lawson Fenning, Big Daddy’s, Cisco Home (so much inspiration) and HD Buttercup. Lawson is still pretty spendy but Cisco and Buttercup both have more affordable/great pieces. We are getting our new sofa from Cisco and I’m VERY excited – there collection is so high quality and designed for comfort, first. oooooooooooooo the BDDW Grane sofa in that floral print? i’m sold! I love how that farm table doesn’t have massive legs. usually they’re so chunky! all i do is obsess over milo baughman. maybe i need to start looking for my own modern day dream furniture! That Ozzie Dining Table! I love it, thanks for the inspiration! You and Amber are my two favorite designers!!! Same. Plus Studio McGee! Killing it, all of you! Totally love these pieces too – especially the sofa and bed with the headboard cushion. I’m obsessed with early 1950s Ercol furniture (which has been reissued) and costs £££. The great thing is that it is possible to find original items on eBay for significantly less than brand new. I’ve sanded and re-oiled them. I get a great sense of having saved something from the tip, up-cycled it into something useable again and my home is furnished with genuinely vintage items with history. 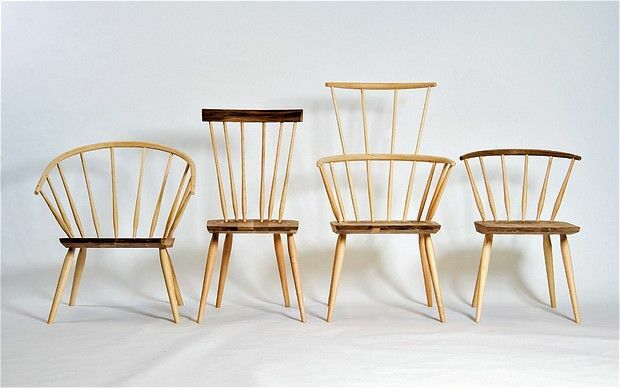 Here’s an image of a selection of Ercol chairs which are made from 100% wood. Emily I think you might like them too as they reflect your style. Thank you for being real enough to acknowledge most of us cannot afford things like this….but I’ll always love to look! Sorry but that Abel Club Chair looks it might use its cute round feet and roll over and punch you with its little wooden fists. It’s like it’s daring you to sit on it! Best post! Loads of inspiration…LOVE the BDDW sofa. Seriously desire to know who makes the two sofas in Amber’s first photo. Feeling obsessed already with how to add a cushion to my headboard. Suggestion for future blog post: how about one focused on California style? The term gets thrown around everywhere, but I don’t think it’s very well defined. It seems to me like a cross between rustic and mid-century, but what makes it special? And, more importantly, how is it different from the Scandinavian version? Is it the colors, the fabrics, the shapes? One more suggestion: the styling posts could have a quiz for the audience (loaded word, but bear with me). Instead of predicting our style, the quiz will test what we learned. Like a series of multiple choice questions with photos, and we’ll have to identify the correct answers. And we’ll get a score testing how good of a stylist we’ve become. Final point: The amber interiors photos look very cool and well balanced, but BDDW is instantly recognizable. Yes, please! I desperately want a post on California Modern. Since I live in one of those SoCal beach towns that were built up in the 60s and 70s, I’m influenced by the MCM architecture, as well as the ocean and sunshine we have year around. But I can’t ever translate that into a style. If I say “Beachy”, I get images of seashell lamps and shiplap- and that doesn’t fit California. Instead, I get the sense that California Modern is a bit MCM and a bit Scandinavian, but with a color palette inspired by the Pacific Ocean. i third this comment…absolutely LOVE amber lewis’s design, but she obviously doesn’t use her blog in the same way you do (to teach style lessons and explain things, etc…but man, do i love the eye candy on her blog and instagram!). would love to see someone with your expertise break down and explain the california style and how it can be achieved. i try to study photos of rooms i like, but it can be hard–if you’re not an interior designer–to recognize what exactly makes it sing to you. Emily can you give some information please for the stunning bird artwork installation in the picture too please?! I love it!!!! And a space she renovated happens to be up on Remodelista today – it’s lovely! Wow – what a beautiful home. I live in Brockely (in a Victorian conversion) which is about 20 min walk away from Peckham (where this house is). Lots of great inspiration. On a side note, having followed the debate earlier on Emily’s blog about her new kitchen and integrated vs. freestanding, tiles or no tiles (and what constitutes a English / European kitchen look), it is interesting to see that the kitchen has a DeVol feel, remains untilled with wood not marble countertops and yet the appliances aren’t integrated. I’ve been looking at kitchens in a whole new way since Emily’s renovation… in a good way of course! Wait wait wait — is that a COFFEE TABLE WITH A TURNTABLE IN IT??? Get the smelling salts. I loooove the NK store. I’ve been slowing buying all their papier mache animals for a hall b/t my two sons’ room — we all love them. But the store. Their style. So good. I recently realized they designed a friend’s house (one of the pics above) — and the whole house is even more stunning in person. So many good LA designers right now. If I had seen that gorgeous, tufted sofa in that delicious rose color before furnishing my apartment, it would totally have been my splurge! Anthropology also came out with a powder pink sofa right after I bought my sofa, that I totally would have bought if I’d seen it 90 days sooner. Now considering custom slipcovers in pink or rose. Oh, that farm table and the tufted sofa. Gorgeous! Thanks for sharing. And yes, totally do use the resource page! Emily, you must seriously consider the Ozzie table for your dining room! It is absolutely beautiful and would work so well in a traditional house with a modern flair. I can’t decide if it is MCM, craftsman, or what, but it is so amazing. A lot of cash for sure, but you’d use it for the next 30 years! I’ve been admiring Sabin’s (http://sabin.la) furniture for some time. Aw – I love this post. We just splurged on the Nickey Kehoe coffee table (in the sogi finish which is amazing) and I’m so happy. But it’s also great to have my opinions validated by a designer I like so much! Congrats on your new house – I can’t wait to see what your end up choosing! I love all the gorgeous furniture! I also really like the company ‘egg collective’. The furniture they make is quite modern but classic. They were featured in Martha Stewart mag awhile back. I especially love the ‘julie credenza’ in white with the brass panels on the front. Dreamy. These are all so inspiring. You might enjoy this east coast company, http://huntandlane.com/lookbook.html. They are a young couple from the US and Java who travel each year to Indonesia to design and manufacture the coolest one of a kind pieces. Their insta feed is a treat too. I love Katy Skelton’s line, which I found through your blog (when you had her Safari Bench in your old master bedroom). I am obsessed also with her Camp Bench and Wythe Cabinets. She also just came out with lighting – her stuff is all made in the US and I think the prices are reasonable for the quality. Love it all! PS – she is also donating proceeds from her blanket collection this month to the ACLU! Nice selection! I love the sofa! And the bed! I am also in the process of furnishing a new home and it sure is hard when there are so many beautiful pieces of furniture like this so far out of our budget! I love Amber Interiors and the Nickey Kehoe round dining table she has used in a few designs. For our mid-century home I have been spending a great deal of time being inspired at DWR and Cisco Home. My absolute favorite find and high splurge was the Rivera sectional sofa from Croft House LA. It is seriously a piece of art. It is even beautiful from the back which was perfect for my situation. I completely blew my budget and am now cutting where I can. It was worth it. Yes, yes, yes, thank you for creating more balance. I loved reading that there is room in your blog for more expansive choices, after all these shops are around because people buy the product, amazing craftsmanship, despite sometimes having a painfully long 6 month wait, plus you don’t get to see your final product in the instance of a live edge walnut slab until it is delivered to you. Personally I agree with you BDDW is one on my favorites and since I live in NY, if I am near by, I am just as likely to pop in there for inspiration of quality and true craftsmanship as I am a gallery. I noticed from a magazine that Meg Ryan also has the Abel style chair in a sofa in her NYC movie room. Unfortunately I think your estimate may be way out, I was looking at a lake credenza, around $30,000 (admittedly a little bigger than standard), so I don’t think that chair will be in the $3000 mark from that company. Hudson furniture also does good quality, I like the rose base walnut slab table. Blackman Cruz, in LA has some unique pieces like the Dichotony Chaok Chest, or Blackman Cruz molarstool. Jean de Merry. Oh my goodness when you had your round up of the all time best end tables, I would have loved to seen Philippe Hiquily side table which would have been for inspirational purposes as they are so hard to find, and CRAZY expensive. Whereas I see the long term value in BDDW. Please share prices once you receive. Having experienced them taking my breath away, I will be one of the supporters. Thank you. Ya there’s a BDDW auction site and they list the Abel chair as being $13,600 retail. !!! So yeah I second that the 3K estimate is far too low. Interesting about the Abel chair. Here is a link to the sofa version in Meg Ryan’s house, that piece so suits her to a T. Emily nailed it by saying the bit of whimsy to it. Dude, THANK YOU for this post. My budget is on the find-furniture-on-the-street side of life, but I would rather see a post like this than a budget roundup any day. I love and love to look at the art of design, to learn about the incredible thought and hard work that goes into creating a thing of use and beauty for our homes and lives. That’s why I come here! Thank you for sharing the beauty these designers and craftspeople have created. One company that seems like it should get more attention for their furniture is The Joinery. They’re pretty small, Portland-based, and they could use better lookbook styling, but if you go to their showrooms when you’re in Oregon you’ll just die over all of the gorgeous wood. Not everything is my taste, but a couple of the right pieces are all you need. The custom version of this bed https://www.thejoinery.com/furniture/bedroom/beds/modern-simple-platform-bed they made us, with a live-edge split in western walnut, is a knockout, and not even that much more expensive than a comparable mass-market version from a place like West Elm. Plus, they’re a B-corporation and focused on sustainability. I was hoping someone would mention The Joinery. Every time I visit their show room I have to pet all the pieces, the wood is so gorgeous and smooth! We recently got our dining room table from them after returning one from Crate and Barrel. Not sure why didn’t visit them first! The quality is miles above, and as you said, not much more expensive. I love the bed from amber interiors. It looks just like the west elm mid century bed that I’ve been eyeing (http://www.westelm.com/products/mid-century-bedframe-acorn-h001). Now considering a DIY project to add that lovely cushion to the headboard too! If you haven’t already, you should check out Verellen! They based in High Point and mostly sell to furniture boutiques, but I’m pretty sure they sell directly to designers as well. They are predominantly upholstered sofas/chairs/ottomans, but they also make beautiful tables (side/coffee/dining). They are definitely pricey, but worth it because the quality is amazing. I visited their warehouse and showroom in HP one year, and I honestly never wanted to leave.. Soooo comfortable. Think you’ll love it, especially if you have any clients that love Belgian inspired furniture. Goes perfectly with the “Californian Modern” style. Forgot to add their website! I wish you would refine your definition of traditional. I realize that you lean heavily toward California Modern/MCM, but I don’t think you really realize how little you incorporate actual traditional design. It would be interesting to see what you could do with only traditional design. Although, it may not be the best thing for your blog since most readers seem to only be drawn to your specific tastes. The Amish also make beautiful furniture and their prices are not this high. I live in Ohio so there are Amish furniture makers out here. I would think you could have stuff shipped. The Amish will usually make anything you want if you give them a picture. Kyle was a contestant on Ellen’s Design Challenge and makes beautiful, and way more affordable, handmade furniture in Detroit. I love that bed! I have total bedroom furniture purchase regret and we just bought our new set a year ago!